Antiracist activist Heather Heyer is one of a growing list of people who have been killed by white racists since Trump’s election. Just months ago, self-described “alt-Reich” activists murdered African-American student Richard W. Collins III. Earlier this year, Ricky John Best and Taliesin Myrddin Namkai Meche were savagely murdered when the two men intervened to stop a white racist from verbally abusing two young black women, one of whom was Muslim and wearing a hijab. Collins’s murder received no response from the Trump White House, while the vicious slayings of Best and Meche elicited a rare and underwhelming comment from Trump. Trump’s muted comments in response to acts of racial terrorism stand in stark contrast to the bombast and vitriol he uses when he’s whipping up his base into a racist frenzy. Trump’s behavior is appalling but hardly shocking. He has been involved in an obscene dalliance with violent racists since his campaign, which saw the Ku Klux Klan, David Duke, and other notorious white supremacists endorsed him. His chief strategist is Steve Bannon, who has previously bragged about his relationship with the “alt-right.” Sebastian Gorka, a deputy assistant of Trump who has established ties to fascist organizations in Hungary, said last week that “white supremacists” are not a problem in the US. If Charlottesville is another episode of racist violence that has been vaguely and quietly criticized by the Trump administration, it also represents an alarming escalation of organized racist violence in the US. Other white supremacist murders that have occurred since Trump’s inauguration could be described as random acts of racist violence. But the events in Charlottesville were planned well in advance. For several months, it’s been known that white racists were going to descend upon Charlottesville to protest the removal of a Robert E. Lee statue from a local park. This ragtag collection of racist organizations have been staging protests in and around the liberal college town for several months — including an earlier version of the tiki torch march that resurfaced on Friday evening. Fascist organizations and their white supremacist allies spoke openly about bringing weapons — including guns — to Charlottesville. And they did, showing up with helmets, clubs, pepper spray, wooden shields, and assault rifles. On Friday night, before their supposed protest, hundreds of mostly young white men marched through the University of Virginia campus, brandishing torches. They also reportedly marched on a black church service being held in preparation for a major counter-protest the following day. It was a naked act of racist intimidation. Despite their claims to only want to exercise their free speech rights, the white racists arrived in Charlottesville to riot, mob, and kill anyone who got in their way. The Southern Poverty Law Center described it as the largest gathering of hate groups in the US in decades. Their mob action revealed multiple realities: they are relatively small, disproportionately violent — and completely coddled by law enforcement. On Friday evening, the police allowed these torch-bearing racists to descend upon a black church chanting “white lives matter” and the Nazi slogan “blood and soil,” with no permit to protest. The following day, police stood passively as white supremacists lined up in formation, charged at protestors, and beat people. 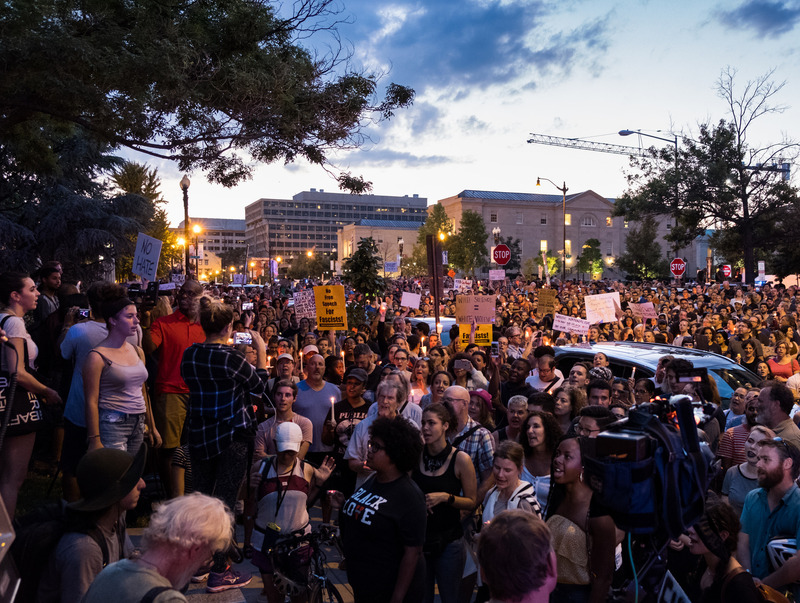 The contrast with police treatment of Black Lives Matter protests was night and day. The police let a racist mob intent on physical violence simply have its way. The white supremacists never had to contend with tanks, tear gas, dogs, water cannons, or assault from riot police. When antiracists chant “the cops and the Klan go hand in hand,” it is this cozy, almost collegial, relationship to which they are referring. Trump’s reluctance to openly denounce the white supremacists that supported his candidacy and now support his presidency has embarrassed his Republican Party into rebuking its association with white racists. By Sunday, it was hard not to find a Republican denouncing white supremacist violence — with the important exception of the president of the United States. The Republican Party is crying crocodile tears. This, after all, is the party that gave Trump the platform he has stood on for months, espousing the vilest racism in modern American history. For months, Republicans have cheered on Trump’s racist rampage in the White House. There was, of course, the Muslim travel ban that Trump called for within hours of his inauguration. But they have also stood by while he’s used Immigration and Customs Enforcement (ICE) to instill terror in immigrant communities through the weapon of raids. Republicans have celebrated the Trump administration and its return to supposed “law and order” rhetoric — led by Jeff Sessions — while Trump simultaneously encourages the police to abuse people in their custody. These central pillars of the Trump administration, widely supported by the Republican Party as a whole, are only the very beginning. In the last several weeks, the Trump administration has signaled their intent to investigate whether white people are the victims of discrimination in higher education. They have proposed limiting the number of immigrants migrating to the United States who do not speak English. And they have threatened to increase the number of raids in immigrant communities while specifically targeting for deportation young immigrants brought into the country when they were children. More than providing a platform for Trump’s racist hate speech, the Republican Party has boosted his political agenda — an agenda that has imbued the racist right with the confidence that they can succeed in their campaign of terrorizing, marginalizing, and even killing those who stand in their way. This includes black and brown people as well as the white antiracists who challenge them. We are all in their crosshairs.